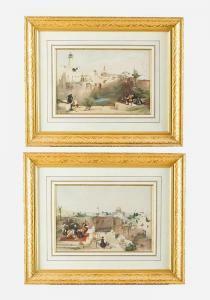 Find artworks, auction results, sale prices and pictures of David Roberts at auctions worldwide. 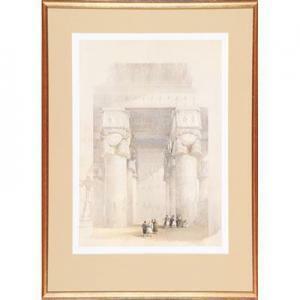 DAVID ROBERTS (Scottish, 1796-1864) Five works: View from Under the Portico of the Temple of Dendur, 1848; Grand Entrance, Temple of Luxor, August 1, 1848, The Grand Entrance to the Mosque of Sultan Hassan, July 2, 1849, Portico of the Temple at Edfou, Upper Egypt, March 1, 1847, and Medinet Abou at Thebes, May 1, 1847; Colored lithographs (each framed); 21" x 15" (largest, sight); Printer: Louis Haghe; Publisher: P.G. Moon, London Not examined out of frames. Toning to sheets and some areas of foxing. Overall good condition. Lithographer: Louis Haghe. Portico of the Temple at Edfou: some water staining to left and top borders. ROBERTS (DAVID) The Holy Land, Syria, Idumea, Arabia, Egypt & Nubia From Drawings Made on the Spot by David Roberts, With Historical Descriptions by the Revd George Croly, 6 vol. bound in 4, FIRST EDITION, 6 lithographed pictorial titles, 121 tinted lithographed plates, 120 half-page tinted lithographs by Louis Haghe after Roberts, lithographed portrait of the author by C. Baugniet on India paper, 2 engraved maps, occasional spotting, publisher's dark purple half morocco, gilt-blocked arms of Jerusalem on upper covers, gilt panelled spines, g.e., worn at extremities [Abbey Travel 385 and 272; Blackmer 1432; Tooley 401-402], large folio (613 x 430mm. ), F.G. Moon, 1842-1849 Footnotes First edition of "one of the most important and elaborate ventures of nineteenth-century publishing, and the apotheosis of the tinted lithograph ... there is pleasure to be had from many of the individual plates, where Haghe's skillful and delicate lithography, and his faithful interpretation of Robert's draughtsmanship and dramatic sense, combine in what are undoubtedly remarkable examples of tinted lithographic work" (Abbey). 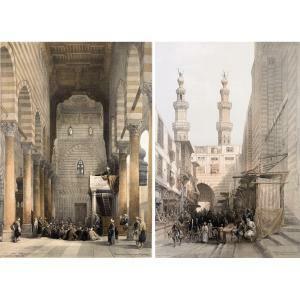 Roberts had toured Eqypt, Alexandria, Jerusalem, Palestine, Lebanon, and Baalbec during 1838 to 1839 making detailed drawings of the most significant sites, from which he worked up the final pictures for his master work. Provenance: Peter Carthew (1808-1870, of 15 A Kensington Palace Gardens), bookplate; Alice Grace Elizabeth Carthew (1868-1940), notes in pencil initialed "A.C.". She was a noted collector of William Blake prints and antiquities, subsequently donating her abundant collections to institutions including the British Museum, The Hunterian, The Victoria & Albert Museum, and the Tate Collection. Alice Carthew's pencil annotations (dated 1914 and 1926) relate to the topographical accuracy of Roberts' views, presumably after visits she had made to the actual locations. For example next to "The Ravine" she notes 'steps not steep enough', and beside "Petra Looking South" "good picture... far too much water", both in volume 2. David Roberts, RA (British, 1796-1864) St. Paul's and Somerset House from Waterloo bridge; Waterloo bridge; Charing Cross railway bridge three, oil on card the largest 10 x 23cm (3 15/16 x 9 1/16in) Painted circa 1861-62. (3) Footnotes When in 1860 David Roberts decided to embark on a series of London views from the Thames, he was already a well-established and successful painter of Scottish and continental scenes, based on studies made during regular sketching tours. In December 1860 he told his artist friend and future biographer, James Ballantine, that he had 'long thought that the river Thames and London itself was as good, if not better, than many things we go to other countries to look for'. According to Ballantine, the idea of painting such a series had been suggested to Roberts by J.M.W. Turner, 'who said he had thought of it too late in life to carry it out himself'. The death of another friend, Sir Charles Barry (architect of the new Palace of Westminster), with whom Roberts had discussed the idea, prompted the artist to begin. During July and August 1860, Roberts made numerous pencil studies during walks 'on and near the river'. The following summer he returned to various locations with watercolours and ready-prepared oil paints, making further studies in summer 1863. He planned to create a series of twelve paintings, which the wealthy civil engineer Charles Lucas agreed to buy. 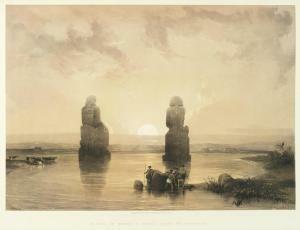 Four of these were exhibited at the Royal Academy in 1862 and two in 1863, but the series was left unfinished when Roberts died in 1864. 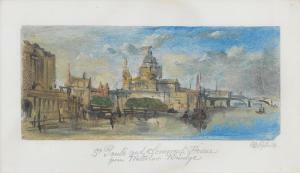 St Paul's and Somerset House from Waterloo Bridge was worked up by Roberts, via a half-size oil study (sold Bonham's, London, 16 March 2000, lot 50), into a two-foot by four-foot painting exhibited at the Royal Academy in 1862 (no. 370; sold Phillips, London, 11 November 1980, lot 18). A more expansive view that included Waterloo Bridge, and was taken from Hungerford Bridge further up the river, is dated 1861 on the painting owned by Lucas (sold Sotheby's, London, 8 March 1989, lot 100), for which a half-size oil study is also known (sold Sotheby's, London, 1982, lot 83). Waterloo Bridge would likewise have been taken from Hungerford Bridge. Behind is Somerset House and in front a distinctive red-sailed Thames barge. Echoing the acutely angled bridge is a watercolour of Blackfriars Bridge, dated 28 August 1861 (sold Sotheby's, London, 14 July 1988, lot 144). Although the third of the present oil sketches has been titled on the mount Charing Cross Railway Bridge, it in fact shows that bridge under construction, with two new cylindrical piers in place beneath the Hungerford Suspension Bridge it was to replace. Designed by Isambard Kingdom Brunel, the Hungerford footbridge had two distinctive tower-topped piers, from which ran suspension cables that were reused for Bristol's Clifton Suspension Bridge; the piers (minus towers) remained as supports for the new bridge carrying trains across the Thames to Charing Cross station. A watercolour by Roberts of the identical scene, including boat-prow in the foreground and Lion Brewery in the distance, is dated 2 September 1862 (Glynn Vivian Art Gallery and Museum, Swansea), and is most likely contemporaneous with the present oil sketch. We are grateful to Krystyna Matyjaszkiewicz for her assistance in cataloguing this lot. Literature James Ballantine, The Life of David Roberts, R.A., London, 1866, pp. 204-5, 207-8, 211, 215-16, 220-21.